Have you ever had any formal or informal paid advertising training or education? If you have, you’re one of the lucky few. Most marketers are presented with a chunk of their company’s marketing budget one day and told to “run some ads.” Don’t let the costs scare you, paid social advertising is incredibly measurable, and can produce real ROI. From managing your budget to choosing channels and measuring success, learn how to get started with paid advertising. 1) How Do I Manage My Budget? One of the most daunting things about social media advertising is the fact that you are dropping cold hard cash on your campaigns. There are also a huge amount of channels and ad formats you can use — don’t get stuck in the details. Before launching your ad campaigns, align your marketing objectives with your advertising strategy. If your goal is to drive traffic and leads, top of the funnel content such as blog posts, free tools, or meatier content gated behind a lead generation form should be used. This type of promotion is more light touch and cheaper. If your objective is to convert leads further down the funnel to marketing qualified leads for your sales team or customers, middle and bottom of the funnel content like free trials or purchase offers should be promoted via retargeting. This type of promotion is higher commitment than reading a blog post, so it will be more expensive. Use this paid advertising budget template to map out your costs before your launch and update it throughout avoid end of the month panic! 2) What Channels Should I Advertise On? The landscape of paid social advertising is constantly changing; new technologies, channels and formats are released weekly. There is no one size fits all answer to the channels you should leverage. Ultimately, testing different channels is the best way to determine what works to meet your objectives. With over 1.4 billion users and over 900 million visits a day — Facebook has the largest audience available, which makes it a fit for businesses large and small. But volume is not everything in social ads. The real advantage of Facebook lies in the amount of granular data available to target users. You can target based on education, employment, household, and lifestyle details. Categories include location, gender, age, language, education, ethnic affinity, generation, household composition, life events, politics, relationship status, parental status, and work. Zero in on whoever your audience may be: friends of couples who recently got engaged, new fathers, postgraduate students, women who work in engineering — the possibilities are endless. Allows advertisers to target people based on their interests, activities, pages liked, and closely related topics. Top level categories include business, entertainment, family & relationships, fitness & wellness, food & drink, shopping, fashion, sports, hobbies, and technology. The level of detail available means you can target very specific interests like bodybuilding, tattoos, or heavy metal music. Target based on purchase behavior or intent, device usage and more. Categories include digital activities, expats, travel, mobile device users, and events. Behaviors like Chrome users, Facebook Page administrators, and business travelers can be used to segment your audience. Custom audiences allow you to layer Facebook data on top of your business data. Advertisers can upload lists of customer (or potential customer) email addresses, phone numbers, or user ids and target these specific lists of people. Pixel based targeting of website or webpage visits is also possible. Advertisers can create “lookalike” audiences from your custom audiences to target similar Facebook users who have a higher propensity to convert. Instagram is growing in popularity with advertisers every day and presents a huge new opportunity for anyone running social advertising campaigns. Now boasting 400 million users, as of April 2016, Instagram is a more popular channel than Twitter or Snapchat. 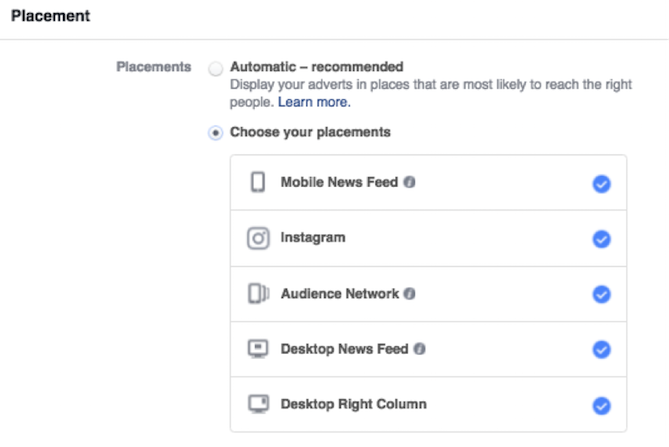 Despite the fact that you can easily select the same ads to be shown on Facebook and Instagram at this level, you should keep your ads separate. The two platforms are very different and you should think about how the audience and experience differs. Instagram is a visually driven platform, so make sure your ads look authentic and fit in with the user-generated content that exists in your audience’s feed. Instagram is often seen as better fit for lifestyle and creative industries like fashion, food and fitness. Don’t let that assumption deter you from trying Instagram, B2B brands have seen success, too. Twitter’s ad platform is not as advanced as Facebook. Demographic and interest based targeting options are available, but they are more limited than other platforms. Basic options only available here — age, language and location. Behavioral targeting exists for the U.S. only at the moment. Options include retail, lifestyle, finance, technology, travel, and more. Categories include health, beauty, business, careers, hobbies, society, sport, and more. One thing to keep in mind — if you were promoting a piece of content on SEO, the closest you could get is the Marketing topic as a whole. The options are not as granular as other platforms. Targeting specific Twitter accounts and followers means that you can build lists of industry or regional influencers to create niche audiences. One of Twitter’s major advantages is the ability to target specific keywords and hashtags. Advertisers can target people who have tweeted using a specific hashtag with their ads. This allows very specific, targeted content to be delivered to people who are actively engaging with a topic on Twitter. LinkedIn is an obvious choice for B2B companies due to its professional user base. If you segment your audience based on their professional information, like role, company, industry, etc., you can be very confident in relying on LinkedIn data to be up-to-date and relevant. If professional information is not an important part of your buyer persona, LinkedIn probably isn’t the best fit for you. While the ad platform is not as advanced as others in some respects (due to the lack of behavioral and interest targeting), the professional data is hugely valuable for certain industries. Criteria available includes language, location, industry, company, job title/function, and membership for specific LinkedIn groups. Costs tend to be higher on LinkedIn than other networks, but conversions and quality can be higher than other networks and can provide valuable leads for some industries. 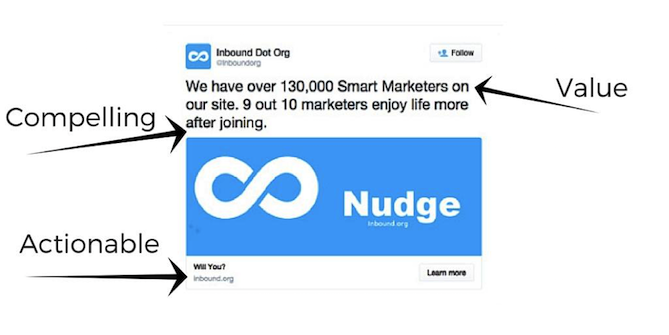 For example, here at HubSpot, we promoted an industry-specific piece of content — The Little Book of Inbound for Finance Marketers — on both LinkedIn and Facebook. The cost per click (CPC) of the LinkedIn campaign was 4x the Facebook CPC. Clicks cost a lot on LinkedIn, but what about actual conversions? LinkedIn traffic converted 52% better than Facebook traffic and LinkedIn conversions were half the cost of Facebook conversions. LinkedIn was the clear winner in terms of targeting and channel “fit” in this case. Social advertising is different to Adwords search advertising. Your Adwords campaigns are centered around demand fulfillment — targeting specific keywords that people are searching for right now. Social advertising is about demand generation, fulfilling a need your audience has even though they are not actively searching for it. I am training for a marathon at the moment, so this is totally relevant to me! 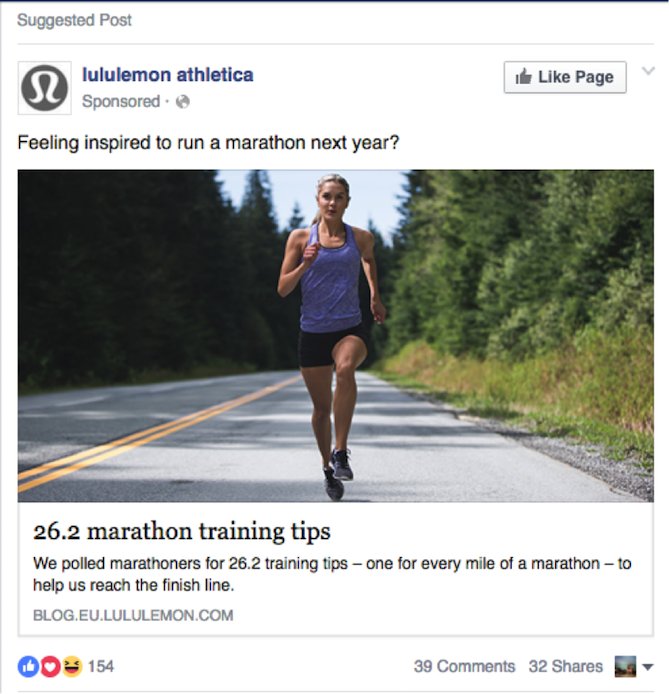 I was not actively searching for marathon training tips, but the advertisers have clearly targeted interests and demographics (it’s also a female centric ad) to present me with content that will stand out to me when scrolling through my newsfeed. The image is often to most important element of a social ad — it’s responsible for capturing your audience’s attention when they are browsing a social network. The first is from DaPulse and the second from Squarespace. 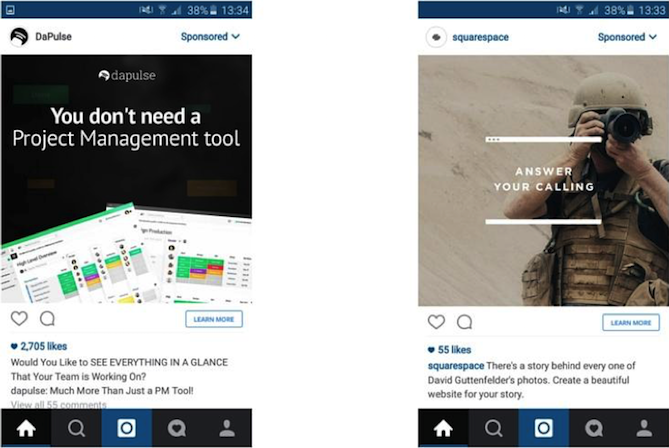 While the DaPulse ad has a beautiful design, it’s clearly an ad, and doesn’t quite fit in with the visually focused Instagram feed. The Squarespace ad captures my attention. It looks like it belongs in my feed and I’m interested in what it is about before reading any copy. The image suits the visual theme that exists on Instagram and elicits and emotive reaction from the user. Be compelling : I’m going to enjoy life more? Sign me up! Communicate your value proposition: The community of intelligent marketers is what makes inbound.org an incredible resource. Be Actionable : Asking a direct question ”Will you?” challenges me to take action. Use Answerthepublic to map out questions people are asking about your topic. Use BuzzSumo to find content that people are sharing around your topic. Read Buzzfeed to draw inspiration from the amazingly clickable headlines. 4) How Do You Measure Success? Paid social advertising has a multitude of metrics you can (and should) monitor. Impressions, clickthrough rate (CTR), cost per click (CPC), likes, shares, frequency, relevance, and much more. Since this can be overwhelming when you’re new to social media advertising, it’s vital to make sure you are focusing in on the metrics that matter most to your campaigns. The three most important metrics to monitor that tell you how your campaigns are really performing are clickthrough rate, cost per conversion and conversion rate. This is a measure of the number of clicks your ad has to the number of impressions it received (clicks/Impressions). Your CTR indicates the relevance of your content to your audience and the quality of the traffic. If you have a low CTR, try narrowing your targeting or creating new ad designs. Every campaign should have one core conversion goal (signups, app install, downloads, visits to blog post). To calculate, divide the amount of money you have spent divided by the number of conversions resulted. This gives you views to whether your campaigns are profitable and allows you to project future spend. Looking at the conversion rate of the visits to your landing page from your ads gives a good idea of the quality of the clicks you are receiving and the performance of your landing page. You can also benchmark your social ad traffic against the conversion rate of traffic from other sources. The paid social advertising landscape is always evolving, to be a superstar paid marketer you need to be reactive to new channels, tactics and formats on an ongoing basis. This field is mastered through research, experience and testing – not through formal learning environments. Ready to start creating your own social advertising campaigns?